Rev. Howard Pippin, Jr. of Aldersgate United Methodist Church (North Coast District) in Warrensville Heights shared that thought following a triple-fatal shooting that occurred across the street from the church on Feb. 5. The owner of Chalk Linez barbershop and two of his friends were shot and killed inside the business. Three others inside the shop were also shot and had to be hospitalized. No arrests have been made and the shooting remains under investigation. Pippin had planned to preach Sunday on love but felt he needed to do more. Before the start of worship he received a text from Stanley Miller. The former head of the Cleveland chapter of the NAACP told Pippin that following a shooting in his own neighborhood parishioners at his church had ended a service by walking to the site of the shooting. “Standing outside the barber shop where the shooting occurred was a gentle witness that love casts out fear,” said Bishop John Hopkins, who attended the service and offered prayer at the vigil. Family members of one of the victims, arriving at the parking lot for their own time of reflection, told Pippin they were grateful to find members of the church praying there. “All but a handful of the people came across the street. Without even realizing it I wept. I wept for the families. I wept for the community. I wept because we were the church in one of its truest forms – the body of Christ gathered for the sake of others,” Pippin shared. 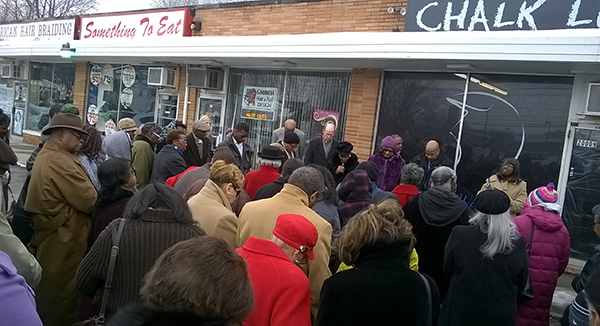 Read more about the prayer vigil. Previous postMovie: The Imitation Game – a smart and compassionate film and one of the year’s best. Thanks for this article affirming hope and the witness of love.